These pitta chips are covered with olive oil, chilli and garlic, as well as salt and pepper before being oven roasted for extra crunch. 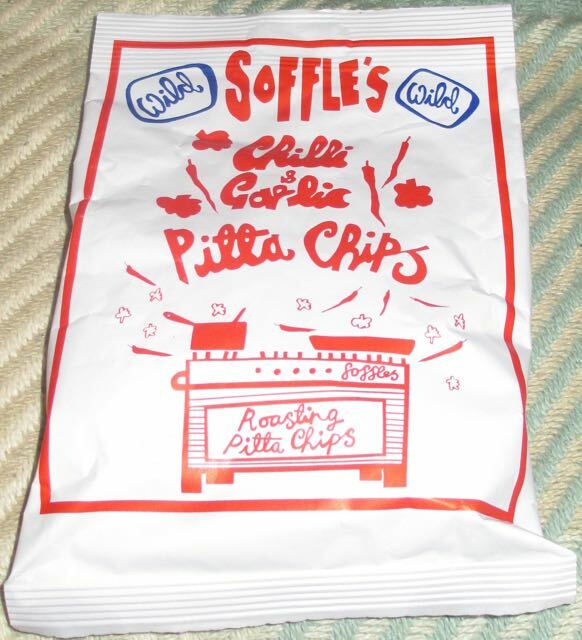 Produced by Soffles in London, these pitta chips were first produced as a pre-dinner accompaniment with beer for friends and family. They proved so popular that Soffles decided to create a business out of them. There was a garlic smell on opening the packet, with a hint of chilli in the after smell. These pitta chips were really very crunchy in a hearty munch munch kind of way, which was great for taking the frustrations of a new job out in the biting! The Scotch Bonnet chilli heat hit me straight away filling my mouth with fire mixed with the lovely roasted pitta flavour. The garlic came in the aftertaste rounding out the chilli burn and rather expertly cooling my mouth down ready for the next pitta chip. Having said that my nose started to run after a few pitta chips and the chilli burn in my mouth just kept on giving. Right... Better go a find a good beer to have these with! 60g with 246 calories, 1.8g of sugar, 6.12g of fat and 1.2g of salt. Ingredients included; garlic, scotch bonnet, olive oil, flour, pepper, yeast, salt and water. Aren't these just amazing? I was able to try to entire range last week and can't wait til I can buy them again!